As any sensible grown-up knows, traffic on a Friday afternoon before a spring Bank Holiday weekend is likely to be bad – and unnecessary driving best avoided. As any sensible adult would almost certainly agree, if there’s also a train strike on that Friday, it’d be doubly foolish to set out on a jaunt. But then, I wasn’t being a sensible adult. Our house looked like an adolescent had been left in charge for a week. I’d been all alone. The academic was researching in Ghana. I was just – um – reading. Weird things. It began with The Stone Book, by Alan Garner. A book which gives me strange feelings inside. Not fear. Not joy. Something in between. Enough to make me wonder about the world. About the connectedness of minds, of Nature, history and prehistory. Of the presence and absence of time. ‘Astride the golden weathercock at the top of the new church, Mary looked down on the Victorian village that her father had helped to build […]. Mary wished she could go to school and learn to read. She wanted a prayer book to carry to Chapel. Other girls in the village had books, although they could not read, and used them for pressing flowers. Now, there are many, many things about this book that make it obviously written for me. But not needing, or wanting, books, you may surmise, isn’t one of them – and you’d be right. Yet, the more I watch and listen and learn from the world out there – and the world inside – the more I realise that book-learning’s only a thin dimension of all the learning-to-be-done about our planet and all that’s in it. There are so many aspects of this book that make a butterfly unfold its wings in my insides, it would take forever to explain. So, here’s just one. Some time ago I wrote an unfinished novel about a young woman. Eve and the Serpent, it was called. Eve met a man who played saxophone in an orchestra. He also played a period instrument. And the instrument was a serpent. Or, more accurately, an ophicleide. Now, I don’t know about you, but despite being familiar with classical music, I didn’t grow up knowing about ophicleides. I only found out about them when I researched serpents (of the musical kind) for this book. 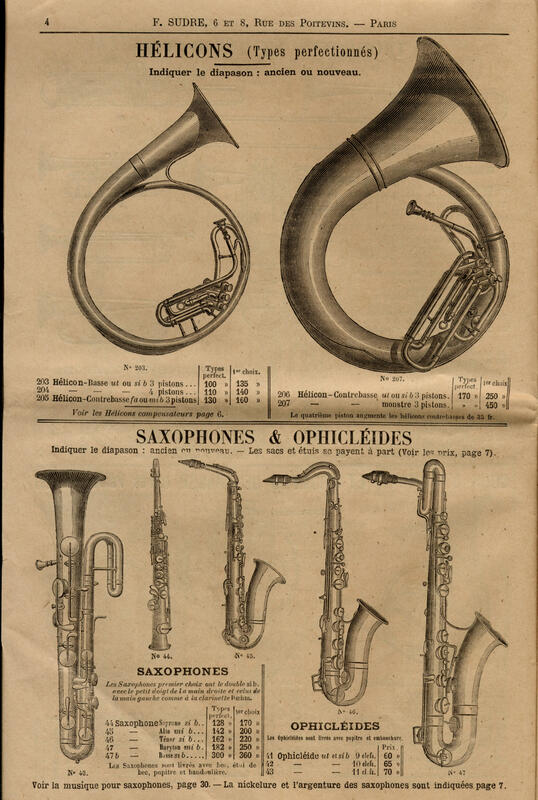 The Stone Book features an ophicleide. Alan Garner is famous for his weird and magical children’s books. Some of you may have read The Weirdstone of Brisingamen and The Moon of Gomrath. A little while ago, I began to take an interest in Norse mythology and wrote about it in relation to trees. Which is when I discovered ‘brisingamen’ originates in Norse mythology as the necklace of the goddess Freya. Alan Garner says he does not write for children, he writes for himself. I read the two ‘big’ books as a child and they are marketed as children’s books, but the final part of the trilogy, only a recent publication, Boneland, is very deep, much more adult in tone to my mind – bonkers but brilliant! It is only thanks to my lovely friend Ginni that I have this quartet featuring The Stone Book. One of the best presents ever. I love connectdnesses – and so revisited the Garner books. Twice. The second time this week. I was so enthralled – in their thrall – that I had to go. I had to see The Edge for myself. 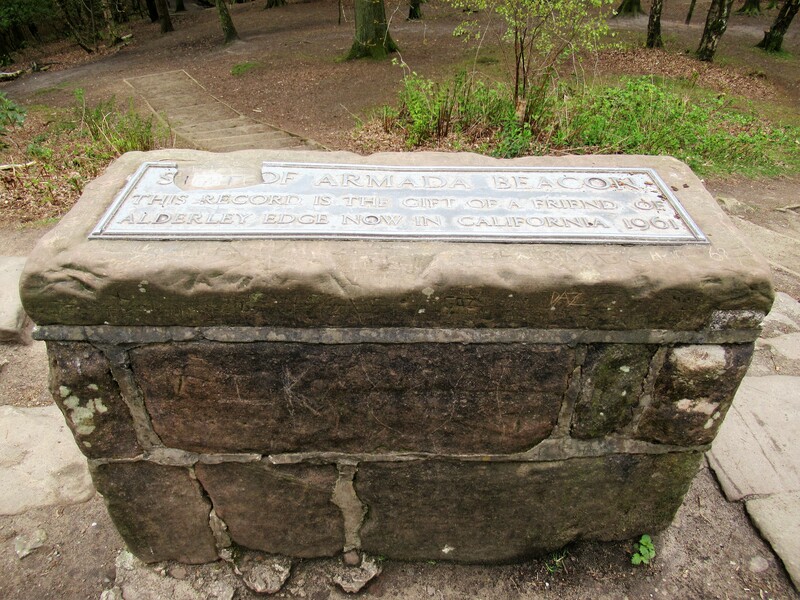 Alderley Edge (where I believe an elderly Alan Garner still lives) is in Cheshire. Cheshire is regarded as the posh bit of northern England. Into which it barely scrapes, being more like northern midlands to my mind. It’s a stockbroker belt. A place of high house prices and footballers. ‘Real Cheshire Housewives’ on TV. On Friday I set out to drive there, selecting ‘avoid freeways’ on the sat nav since I was all alone. Because between me and the Edge is the M6, a motorway I’ve mistrusted ever since I was 21 and the best friend a girl could wish for was killed on it in a car crash. But … Bank holidays are also the time when roadworks appear at the least convenient times and places. And after two ‘detours’ I succumbed. Parked. Re-set the sat nav for ‘fast’ and joined the cantering hordes on the dreaded M6. It was only then I realised I was heading for Manchester airport and felt a pang of guilt. If I was going to drive there for a jaunt, why not to pick up the homecoming traveller on Saturday? So much guilt. Over so many things. Over so many years. But on I pressed. Past the constituency of our former Chancellor of the Exchequer (we’ll come back to George Osborne later) and finally, to Alderley Edge. There’s a ‘village’ of that name below the actual Edge. The high street was busy. Stuck behind a black, Porsche 4×4 which was waiting to turn into the car park of – where else – Waitrose [foreign friends – this is an upmarket supermarket] – I watched an unrelenting parade of white or black, shiny 4x4s heading in the other direction and began to regret my venture. What if the Wizard café (my first goal) was secretly ‘stockbrokers only’? Well, there was no turning back, now. The Porsche turned. I ploughed on. Up the hill. Past men in ear protectors mowing other men’s lawns. Past gates and walls and rhododendrons. To the top of the hill and ‘you have reached your destination’ – a rough roadside car park. Not the Wizard’s place. Two men in real workmen’s gear stood chatting. 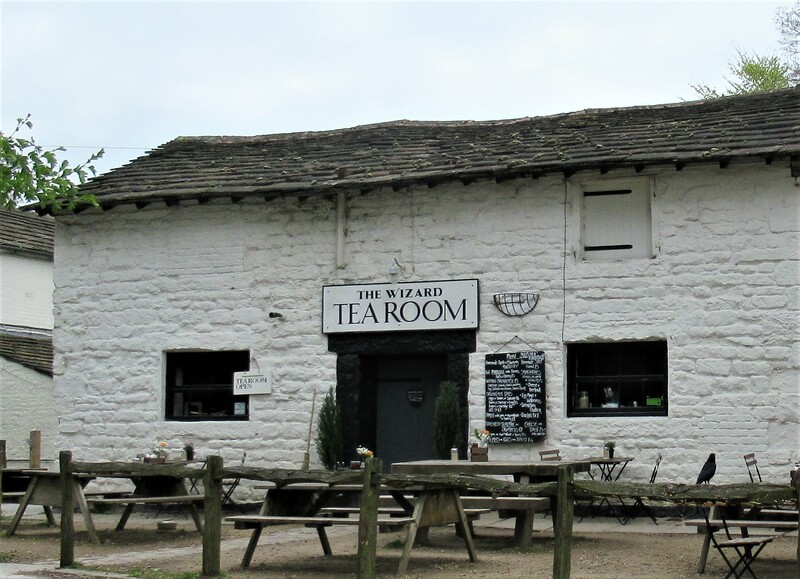 The Wizard’s Tea Room raised a smile and a wave of the arm. So, on I drove. Found it. Parked. And heaved a sigh of relief. It was small and dark inside, but then wizards are comfortable with darkness, I imagine. I ate a toasted bacon sandwich – delicious, thick bacon, no fat, perfectly cooked – and drank Cheshire tea. The ‘loose leaf’ tea, oddly, came in a bag – albeit a large one. The time had come to brave the hill. Fearing disappointment, I reached a gate and hardly dared pass through. But then I saw a sign: ‘To the Beacon’. I thought of the eve of Gomrath. Of the fateful decision of Susan and Colin to light a fire. And how close the world then came to ending. Part 2’s about vistas, visions – and a rather angry me. This entry was posted in Art, jaunts & going out, Britain now & then and tagged Alan Garner, Alderley Edge, bank holiday weekends, Beacon, George Osborne, ophicleide, roadworks, The Moon of Gomrath, The Stone Book, The Weirdstone of Brisingamen, Wizard's Tea Room. Bookmark the permalink. I’m glad you ignored the guilt and pressed on — to find perfect bacon and the Armada Beacon … and, wait. What’s this about a rather angry you? I will be eager to read your next installment! P.S. 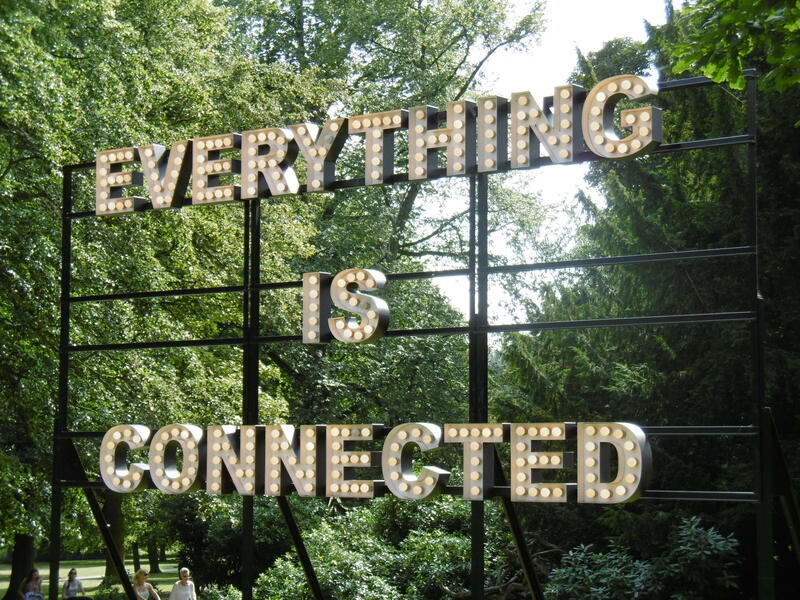 : Everything IS connected. Sadly, I think it takes at least a couple of lifetimes to figure out how. I’m looking forward to your next instalment too…. Did you know that Alan Garner’s wife is called Griselda? She is the daughter of some extremely good friends of my parents (all long since departed) and I knew her – and Alan – quite well in another life. Connections, eh? I was surprised how poor the signage was I must admit – and there must be a lot of archaeological interest. Apparently, my in-house source tells me, some work that has been done there has not yet been published… Perhaps one day. 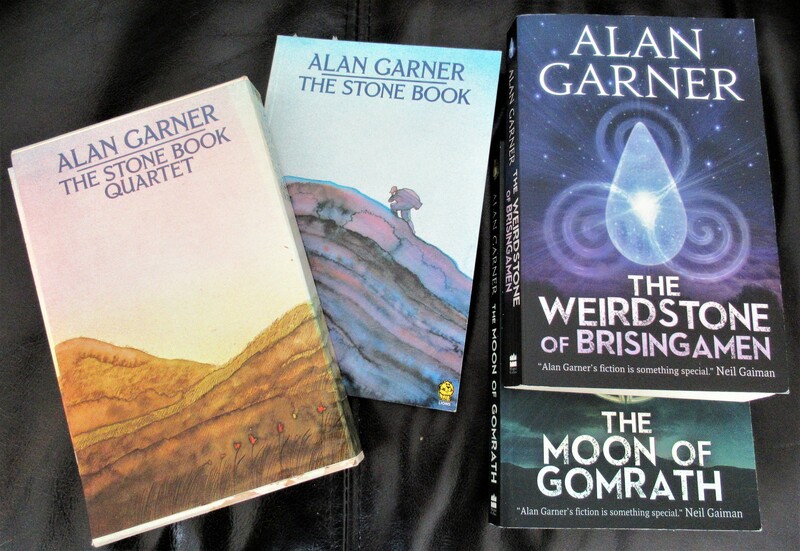 I’ve never read Alan Garner but my interest is sparked. Like you, I could never manage a world without books, or reading, but most of my students boasted that they never read books. Some of them liked to boast that they couldn’t read… until I threatened to march them off for a literacy assessment with an earnest lady about the age of their mothers. Lech Walesa also boasted he had never read a book cover to cover, although his intellectual fellow activists used to figure that he must’ve done, because he used to come up with random snippets of economic theory. I love visiting places where things happened in literature too. Two years ago, I made my husband drive from Halifax (in Canada, btw), across the Confederation Bridge (13 miles across water) to Prince Edward Island, to see where Anne of Green Gables had lived. We visited a museum which was a house the author (L M Montgomery) had visited as a child. I was in tears for about an hour. And yesterday we visited a cafe, ‘The Case’, in Suffolk, which used to be The Case is Altered, which features in Margery Allingham’s ‘The Return of Mr Campion’. Ah, Margery Allingham, yes. Classic cases 🙂 I love detective fiction, though not the really gory sort. When all else fails, if I need distraction, it works. I didn’t know that about Lech Walesa – I guess he thought it would contribute to his cred among the workers? I confess, I haven’t read Anne of Green Gables, but the Bronte house sometimes moves me to tears (when it’s not busy). A life without stories – even if we don’t read, would be poorer. There is something energising mentally about a good story, even if we set aside book learning (which I don’t by the way, but there’s a great quote about it coming up in part 2!). Regarding ‘setting aside book learning’, I feel we do too much of it. At my advanced age, and having taught for 20 years or so, I don’t want to study anymore, just get on with life.